The big security and threat management problem isn't from a lack of information, but too much. We are swimming in data, much of it ambiguous and sometimes even contradictory. The result can be erroneous or incomplete analysis of threats, leading security and risk departments astray at great cost, both in hard dollars and lost opportunities. With all the data and feedback that we get, how does an organization tighten the loops and speed up threat detection and response? 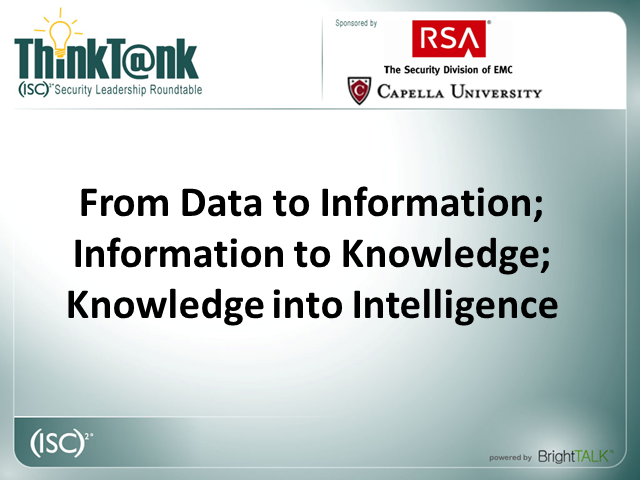 Join us on November 17, 2011 at 12:00pm (Noon) Eastern time with RSA, The Security Division of EMC and Capella University as we explore how to interpret and use the intelligence that we gather and hone the analytical habits we need to be successful in a proactive fashion.